China is the third largest country in the world, just behind Russia and Canada. Some count it as the fourth largest one that is right behind the U.S.A., depending on how its territory is measured. It has a population of about 1.3 billion people, meaning that out of every 5 people in the world, there is one Chinese person. 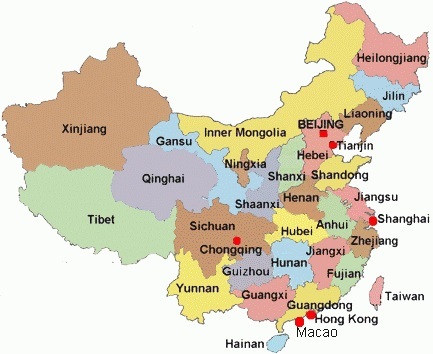 Since China is huge, it has 34 provinces AND areas that are at provincial level as showed on the map below. It includes four Municipalities, two Special Administrative Areas, five Automnomous Regions and twenty-three provinces. P. R. China considers Taiwan one of its provinces while Taiwan considers itself a country at present time. This has been a debate and fight since 1949. The following are provinces of China and areas that are at provincial level. You may find out the hotel costs in their capital cities by using the price-finder below if you plan to visit there someday. Shaanxi - Capital city: Xian, or Xi'an, the place where the Terra Cotta Army is located. Hainan - Capital city: Haikou. Sanya is its second largest city and a great tourism attraction. Wonder how much your money is worth in China? You can find it out here. Plan to fly to China? Compare Price and Find Cheap Flights to China here.